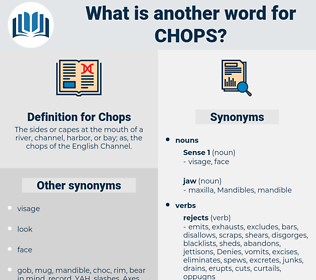 What is another word for Chops? 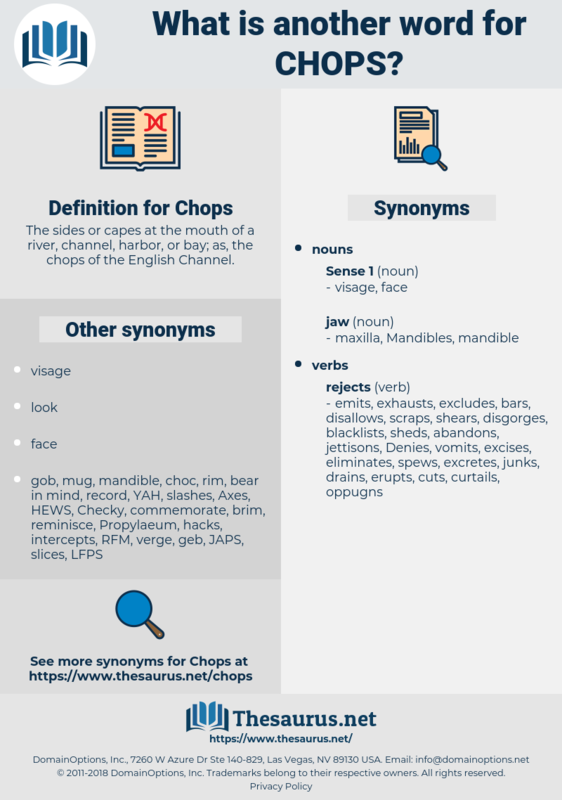 The sides or capes at the mouth of a river, channel, harbor, or bay; as, the chops of the English Channel. cheeks, vocalizations, hog, hogs, coastlines, shorelines, Pigs, shores, coasts, stamps, swine, Scales, Talents, ribs, seals. punches, knock, knocks, afflicts, infects, Affects, Kicks, swings, stabs, hits, beats, Strikes. She had a sick kitchen for people who were leaving the hospitals, weak still and unfit for their work: mutton - chops and words of encouragement were dealt out to them; a ground - floor room had been fitted up as a reading - room, in which she gave weekly banquets of strong congon and dripping - cake, such as her guests approved.